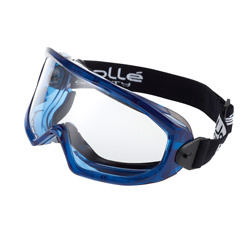 Bolle is by far the leading manufacturer of safety eyewear in the world. They are one of very few companies left to actually do their own research and development, leading the field in protective eyewear. 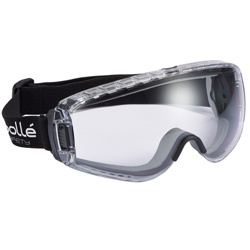 Although we sell various other brands of safety eyewear we made this page to list all the Bolle products, making it easier for you to find what you need. Everything you see is kept in stock for next day delivery. 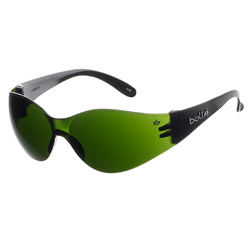 Reassuringly expensive are the Voodoo with polarised lenses and styled from the Bolle leisure division which have then been reverse engineered into safety glasses. This design was originally from the surfing and ski community but has become a popular style all round now. 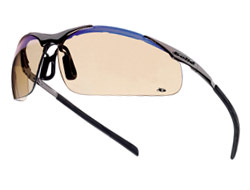 The Slam combines both frame and lens into one to give maximum viability and light transmission. The panoramic and wrap-around design makes it very secure even when working face down. 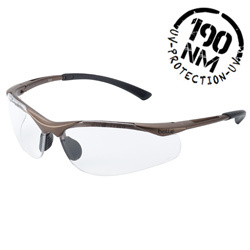 A very advanced pair of glasses with the maximum UV protection afforded down to 190nm! A lightweight, T-rated, fully wrap around design with a transparent frame gives a huge panoramic view. Integrated non-slip foam temples including all the standard anti-scratch and anti-fog lens properties. Extremely comfortable for continual use. 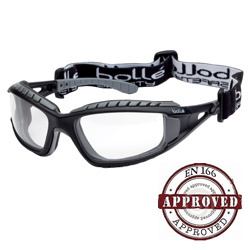 The latest pair of exceptional safety glasses from Bolle the Tryon. 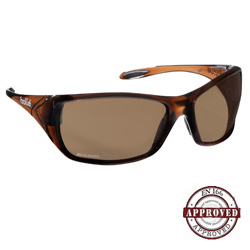 A sporty, warparound pair of safety glasses that combine comfort with style. They are also available in four different lens types for a range of applications. Looking for some affordable reading safety glasses but don't need to go for a full prescription pair. Then look no further! 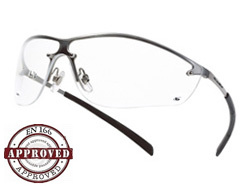 The IRI-S are stylish, comfortable and provide a memory form nose bridge and adjustable temples. They come in clear, smoke, twilight lenses. In the clear lens you can also get a reading area. These are the aluminium version of the standard Contour above and yet they still weigh in at only 38g per pair, lighter than many polycarbonate models. 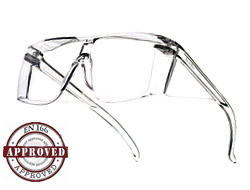 Although a little heavier they offer the additional protection that comes with a metallic frame. Available in 3 lens types. The Cobra is one of the most versatile models around and with the new kit you can interchange your favourite lenses and wear the them as either glasses or goggles. 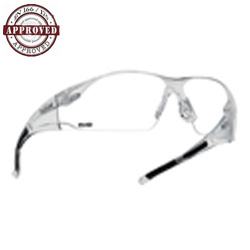 The cobra kit use extra strong B-rated lenses and make them highly popular in the medical profession. For thos looking for a choise of lenses the Cobra Kit comes with 3 different lenses for you to swap and change they include smoke, ESP and clear lenses. 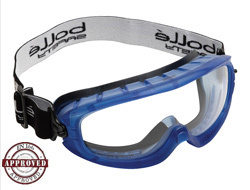 This is the best selling pair of safety glasses in the UK. At only 34g in weight, anti-scratch & anti-fog lenses and TipGrip temples, it is easy to see why this is so popular with our customers. 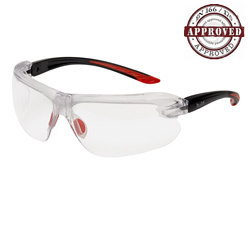 A simple & lightweight pair of safety glasses at a great price. 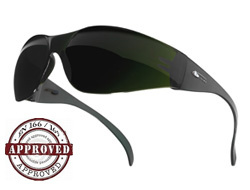 Compliant to both EN 166 and 170 they incorporate UV filtered lenses, protective side and upper shields. The Squale is regarded as the best and most stylish visitor cover spec on the market with anti-fog and anti-scratch properties. Ideal for customers and clients you want to impress, they are designed to fit to every face and over 99% of prescription eye glasses. Tired of uncomfortable safety goggles? 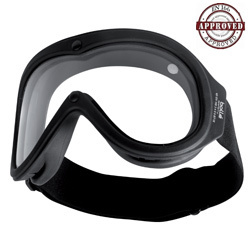 The Atom has the same high specification of the other premium Bolle goggles but with the added benefit of a foam insert similar to what you find on skiing goggles for extra comfort when worn for prolonged periods. The Blast has the highest specification of all our goggles with a ski-goggle style design giving them a large visible viewing. 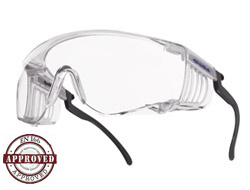 Available in both ventilated and fully sealed versions with anti-scratch and anti-fog lenses. 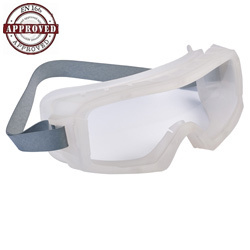 Blast is one of the only safety goggles to also comply with full European UV protection. 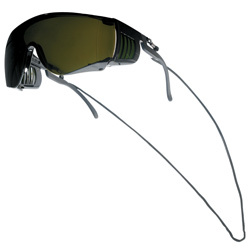 The Superblast is the replacement for the popular Blast goggles. 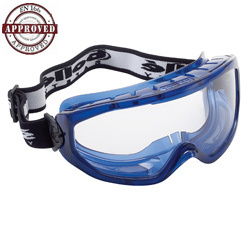 It has the highest specification of all our goggles with a ski-goggle style design giving them a large visible viewing. 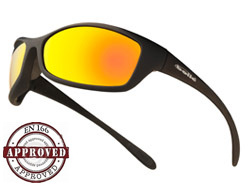 Available in both ventilated and fully sealed versions with anti-scratch and anti-fog lenses. Of all our safety goggles the Elite has the widest field-of-vision. 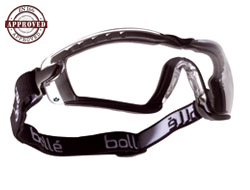 With a clean transparent frame, liquid overflow chutes and adjustable straps on a pivot, they are a very popular goggle. Available in both sealed and ventilated models. 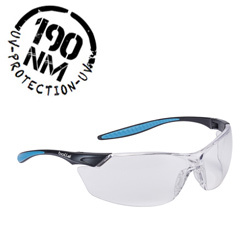 The x90 is ultra slim, lightweight and a low-profile pair of safety goggles. 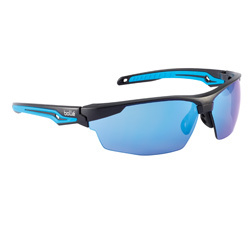 They are ventilated and come as standard with both anti-scratch and anti-fog lenses. An adjustable strap uses ball-pivots to allow for an exceptional fit. 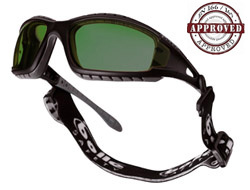 The Fight Fighter is our best safety goggle. Due to the unique Krayton frame material, this model is highly popular in the fire service and anyone working at extreme temperatures. 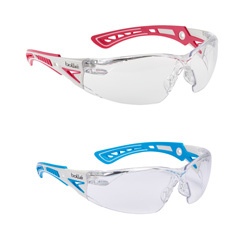 Its unique double lens offers protection to steam, gas, dust, vapours, liquid and molten metals. 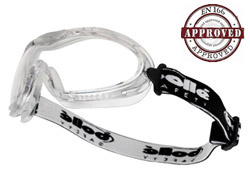 Possibly the most stylish safety goggle on the market but don't be fooled into thinking it is just a pretty face. The Pilots' specification is outstanding and offers a huge field of vision. Protection from almost all the elements, dust, liquid, molten metal and more. 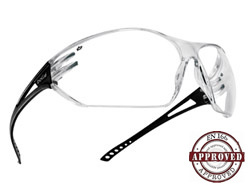 The Coverall is our entry level autoclave model designed to fit comfortably over the top of existing prescription glasses. 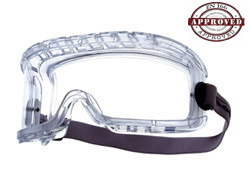 It uses indirect ventilation and EN166 grade 3/4 frames for maximum protection against liquids and dust. 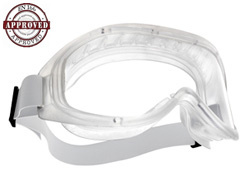 An advanced close fitting autoclave goggle with optical quality 1 lenses and ventilated frame. They are fully adjustable, can be worn over a respiratory mask and designed to be especially comfortable when worn for long periods. The Slam is out ultra-enveloping welding model giving both a large viewing area and wrap around design. 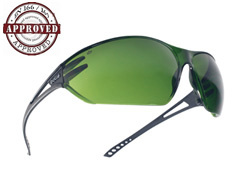 Built with T rated lenses giving protection from extreme temperature impacts. Each pair comes with an adjustable next cord and is available in three welding shades. The Squale is regarded as the best and most stylish visitor cover spec on the market. Now in the welding shade 5 lens with anti-scratch properties. Ideal for customers and clients you want to impress, they are designed to fit to every face and over 99% of prescription eye glasses. 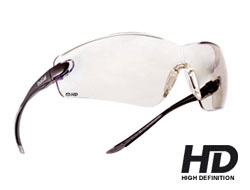 A very close fitting and light-weight pair of welding glasses with a full wrap-around design. 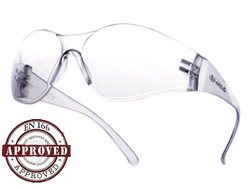 Weighing it at a mere 28g they are the lightest pair of EN169 welding approved glasses on the market and include anti-scratch lens properties. 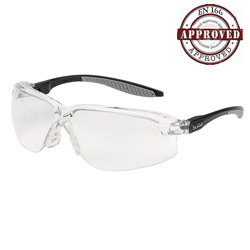 The Tracker is a highly popular pair of safety glasses due to the fact it also satisfies the strict requirements of a safety goggle when used with the removable head strap. It is this versatility which make it equally as popular for welding eye protection and available in all 3 shading levels. An entry level model with a wrap-around design but without the special features of the more advanced styles such as anti-scratch lenses.